I havent written many reviews on cosmetic products yet, while its true that I'm a skincare addict its time to blog about k-make up now. Korean gradient lips have been a trend for quite some time, with the gradient lip look the inner part of the lips has that just-sucked-on-a-lollipop effect, its a more subtle variation of the ombré lip look (using two colors). The gradient lips are natural enough for everyday use, but what about two different lip colors? 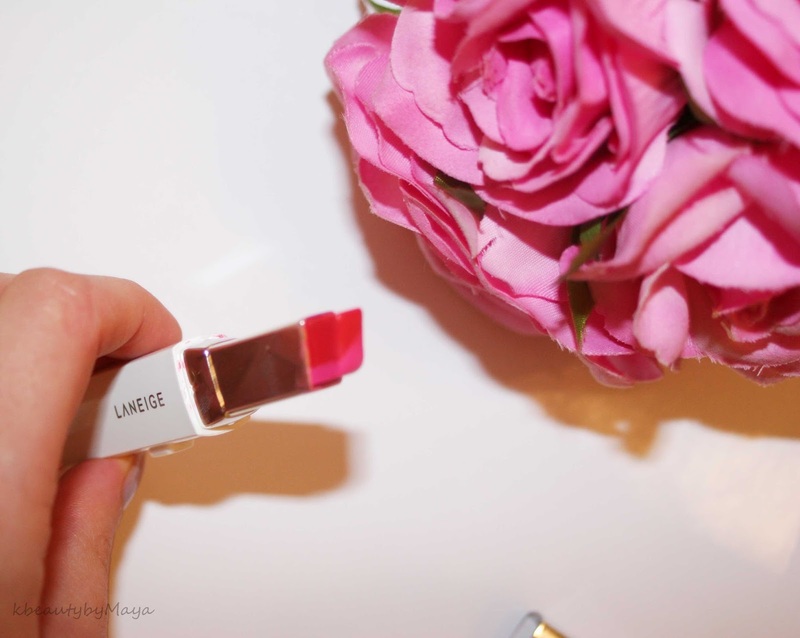 The Laneige Two Tone Lip Bar is supposed to create an ombré look with two complimentary shades, in one stroke. There are different shades to choose from, some are a mix of two contrast colors others offer more of a gradient look (with lighter shades). I got the #5 'daring darling' variant, a combination of two shades, pink red and coral red. I think the name is a good description for the color combination. Of course you could try to create the look using two different lipsticks, but let's see if we can get that style with just one lipstick alone. The lipstick comes in rectangular plastic white tube. To push out the lip product there is a push up lever on the side, and the tube closes with an click on cap. Press the level down to push out the product and press up to push it back. 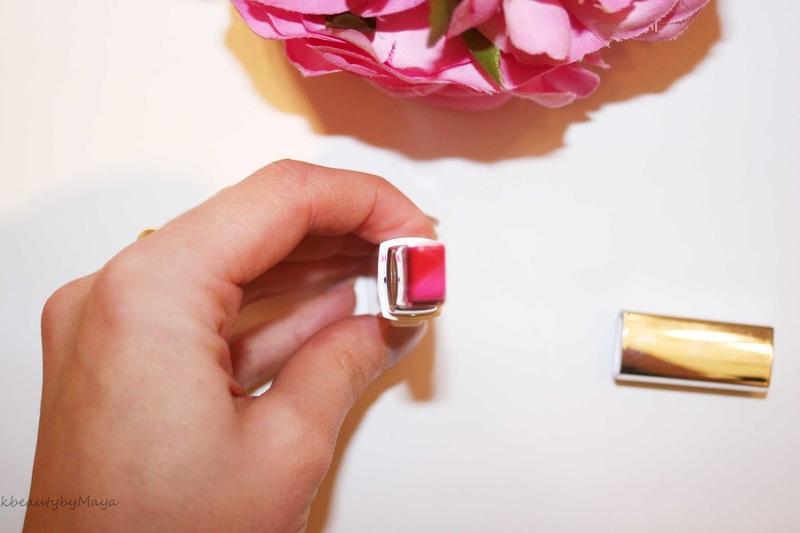 There is no twisting up the lipstick, It's definitely not your average lipstick packaging. The two colors are diagonally cross cut and the product has a rectangular angled shape stick, which is supposed to make application more precise and easy. I find that the cross-cut can create a somewhat uneven application, you have to carefully apply the lipstick with the right corner to the lip side to get and even look with the two colors. The texture of the lipstick is very soft and feels very moisturizing. If I had to categorize its definitely a 'real' lipstick formula and can't be compared to a lip balm. The color payoff is strong, you don't have to put to much pressure on the lipstick. My nose can't detect any scent, I don't know if this is a good or bad thing. I do like lipsticks with a soft floral scent, but I imagine that many prefer fragrance free lipstick. 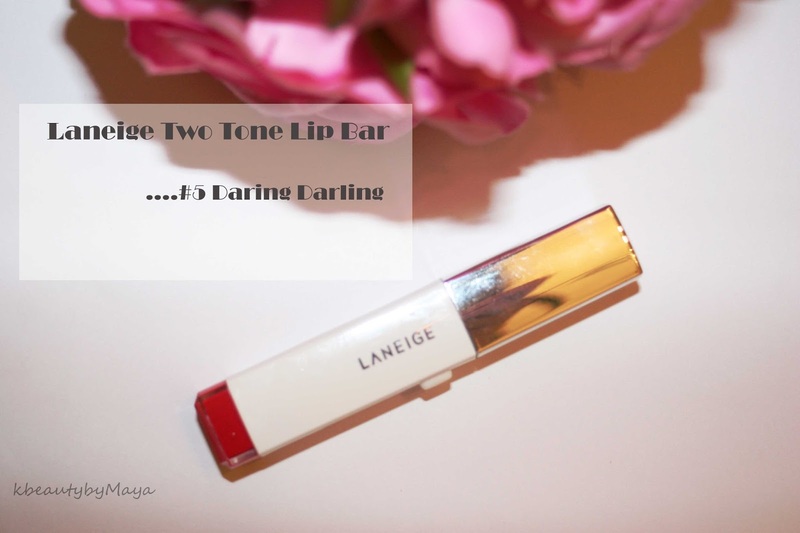 Here is how I create a two tone gradient lip look with the Laneige two tone bar 'darling darling'. Step 1) glide the darker color shade on the inside of your lips. You can also reverse the colors which will also look great, but a darker color on the inside gives you that bitten lips look. Because the colors are in a diagonal cross cut you have to flip the sides of the lipstick when applying it on the left and right part of the lip. The application is not always even, but you can touch up later to correct. 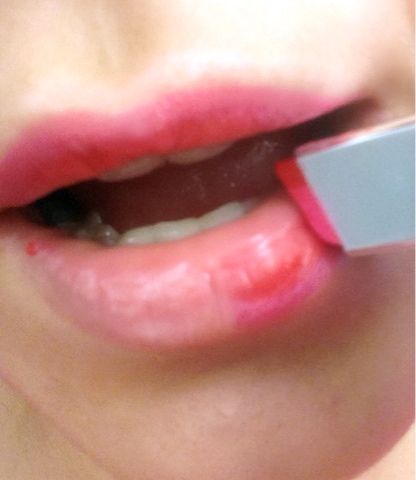 Step 3) press your lips together and touch up were needed using the edge of the lipstick. Creating the look was actually I easier than I first thought it would be. On the lips it looks quit similar to the 'model look'. 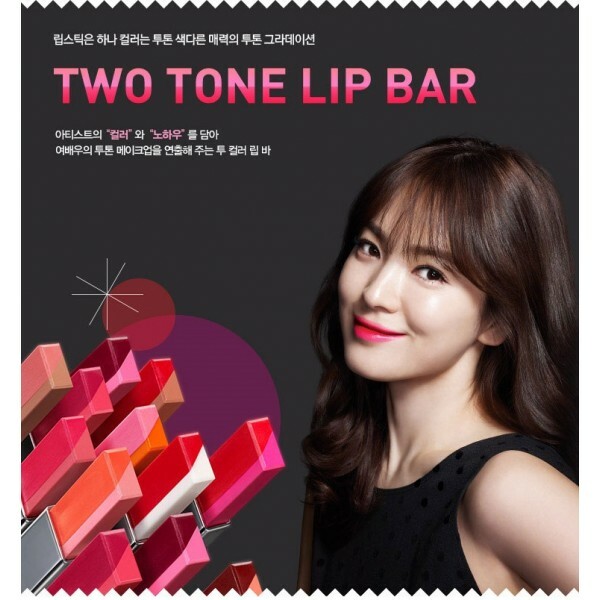 The two colors don't bleed into each other and the rectangular shape seems to work well for precise application.However, the way it looks on your lips depends on your lip shape. I think the contrast would be better visible if I had more volume in my upper lip. On very thin lips the ombré effect may even be absent. The rectangular diagonal cross shape can be a little bit confusing at at first and you definitely need a mirror. 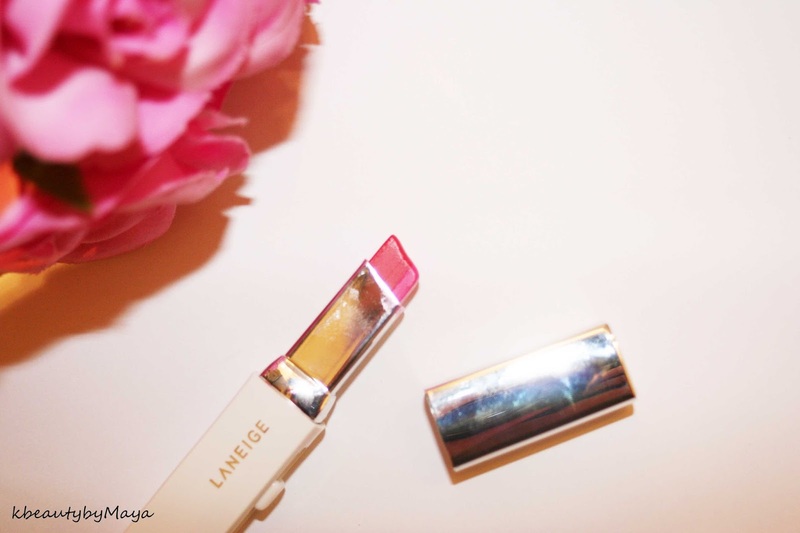 The Laneige two tone bar is a creamy hydrating lipstick with strong color payoff. The lasting power is quit strong, staying al least 5 hours. I really like the 'darling darling' shade, the combination of pink and coral red is quit unique. At first the combination looks weird, but ones applied the color match each other and it looks kind of modern. I can't wait to try out other shades from the line. Overall, nice product if you want to play with the ombré look and color contrasting on your lips. The product isn't cheap but you get a good quality lip product from Laneige and a unique concept. *This post contains affiliate links (with an asterix *), shopping with them will support the blog. Oooo this looks way cool! I wanna try it for sure. Oooh! I'm glad you tried this out, I was wondering how the 2-tone effect looks. Yeah I was surprised too how even the colors look ! That looks so good on you! I've always wanted to try a 2-tone lipstick, but it seems like too much thought when applying >_< Thanks for sharing and reviewing!